Snapchat famously rejected a $3 billion acquisition offer from Facebook back in 2013, but that hasn’t stopped Facebook from taking the features that make Snapchat great. The latest is Stories, a visual diary separate from your main news feed that disppears after 24 hours. 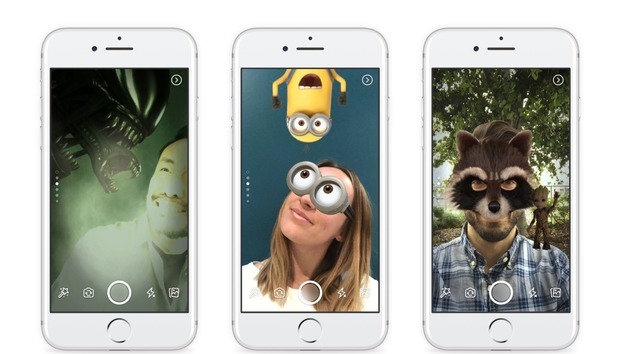 Facebook is adding the Snapchat clone to its iOS and Android apps today. This is what Facebook looks like now. Your Facebook news feed now looks much different. As soon as you open the app, you’ll see Stories from your friends in a horizontal scroll. Simply tap on their profile icons to watch the story unfold just like you do on Instagram. To create your own story, tap on the Your Story icon at the top of the news feed or swipe right to jump right into your camera. Facebook has added camera filters and masks, just like Snapchat’s, and is even partnering with brands for themed lenses, just like Snapchat. If you don’t want to add a photo or video to your story for the world to see, you can send it directly to a friend or a group with Facebook’s new Direct messaging feature. It’s a little strange—Facebook spun off its messaging functionality to Facebook Messenger, and enraged many of its users in the process. Now Facebook is adding a new chat product back to the app with Direct, which is confusing. But Facebook Stories and Direct messaging make sense from a purely competitive standpoint. Facebook has watched Stories become a huge hit for Snapchat, which began as an ephemeral messaging app. The company has since added the feature to Instagram, WhatsApp, and Facebook Messenger. Now the world’s largest social network is putting Stories directly inside its main app, giving its billions of users yet another way to broadcast their lives to their friends. The story behind Facebook’s stories: Maybe Facebook won’t kill Snapchat altogether, but this can’t be good. Snapchat just became a publicly traded company, and one of its risk factors is Facebook. The company’s stock immediately fell upon the Facebook Stories announcement, though it’s obviously too soon to tell what long-term effects the new Facebook feature will have on Snapchat’s user engagement numbers or ad sales. Snapchat is notoriously difficult for newbies and olds to use, and Facebook isn’t. By putting Snapchat’s best feature in its own app, Facebook just gave its billions of users less of a reason to try Snapchat at all.